September 8, 2015 September 8, 2015 Nefer Khepri, Ph. D.
It’s always a lovely thing when out of nowhere someone extends to you an unexpected kindness. It could be something small & easy to give, like a smile; or, something large like a scholarship for a spiritual course. I have been the recipient of both over the past few days. Friday I went to the grocery store for just a few things. As I stood there choosing some chicken a woman walked up beside me to do the same. She turned to me, caught my eye and simply smiled. I smiled back and at that point the light that shone from her eyes touched my soul and made me want to cry, but I kept smiling instead. I told him he must be psychic and he said no, that he just blurts things out. I said “that’s almost the same thing as being psychic, depending on what you’re saying at the time.” He then admitted to “just knowing things for no reason.” I told him THAT is what it is like to be psychic. I then told him about the latter half of my week to that point. Sheila, about 3 months ago. Note how her hind leg protrudes. The tumor was so large she couldn’t sit properly. Wednesday morning our family dog injured herself while playing outside. She’s 10 years old, but has the heart of a puppy. She’s extremely playful & doesn’t realize her body is a lot older than her heart. She came up lame & couldn’t put any weight on her right rear foot. So she saw the vet early, and praise the gods she got injured! If there was EVER a “happy” accident, this was it! The vet thought her abdomen looked a bit distended since he had last seen her in early July when everyone assumed it was just “middle age spread” so nothing was done at that time. He diagnosed a torn ACL in her leg, but x-rayed her abdomen. In the x-ray a giant white mass showed up that he said was a “growth.” He did not want to use the “T-word,” – tumor, but I knew that’s what it was. Sheila was immediately scheduled for an ultrasound on Thursday. Diagnosis: a spleen tumor that had eaten up nearly all her spleen so it no longer functioned. The tumor was so large it was pushing her spine upward, had pushed all her organs except for her heart out of place & the tumor had about 3 – 4 mm of growth before it would touch her heart & probably cause a massive coronary. It had to come out. Friday, just before we took her to the vet for her operation. Stress was high at home anyway. My husband may be losing his job in November if he doesn’t make his quota at the bank & November will be his 1st anniversary working at that particular bank. Then this happened with Sheila. We decided to do all we could for her despite not having the money. When a job is in danger you save, save, SAVE just in case you end up unemployed for a time. It was the right thing to do. Sheila has brought us much joy over the years & is a good & loving dog who is excellent at keeping an eye on our home. We owed her the best care possible. Long story short, as I told the checker his eyes filled with compassion. He insisted Sheila would be fine, not to even worry, that she was in the hands of angels who would be assisting the vet. He pointed out what I believed: she had torn her ACL for a reason, so she could receive proper treatment before the tumor got so large that it killed her. As it was, according to the vet, that would have happened over Labor Day weekend & he’s convinced Sheila’s time was THAT short, so he had fit her into his schedule, moved appointments & performed her surgery on a day when the clinic does not do surgeries. He is a new vet there & this was only his second time seeing Sheila. A word about Dr. Rockar. We met him by “mistake.” I use quotes around the word “mistake” because there are NO mistakes. Everything happens for a reason. My cat had her well visit with her regular vet whom we’ve been seeing for 2 years. I brought my cat in at the right time, but the wrong day. Her regular vet wasn’t there, but Dr. Rockar was & he told the receptionist if I didn’t mind waiting 30 minutes (they had a big emergency with one of their patients) he would see my cat. I figured if nothing else it would save us another trip the next day so we waited. 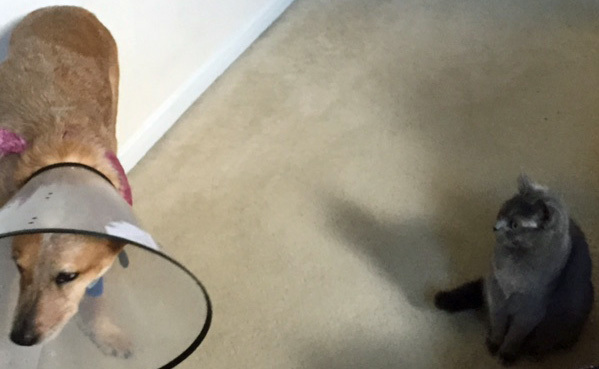 Dr. Rockar was so awesome with my cat I decided on the spot to switch vets. When it came to be Sheila’s turn for her well visit the next month she was also switched & saw Dr. Rockar. He was the one to perform the surgery. He saved Sheila’s life. As I shared all this with the checker he asked if I’d mind if he prayed for our dog. Mind? Me, mind?? So he, the bagger and I bowed our heads right there in a super busy grocery store & the checker said a little prayer. He prayed for Sheila & also for the entire family, that we have faith and be at peace. I shook his hand when I left and hope I see him at the store again sometime. 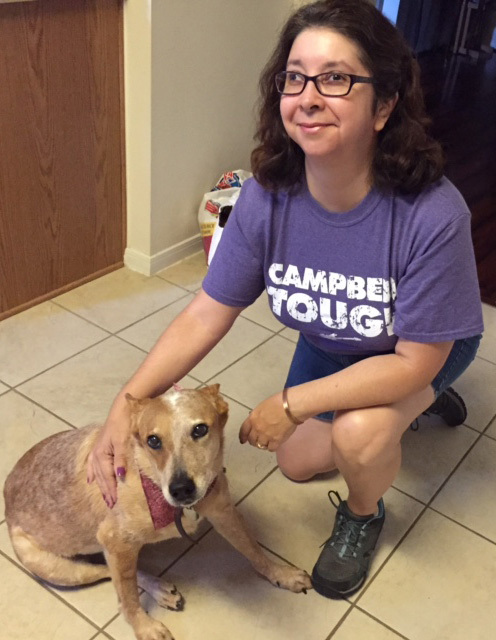 Sheila’s nearly 9 pound abdominal tumor! 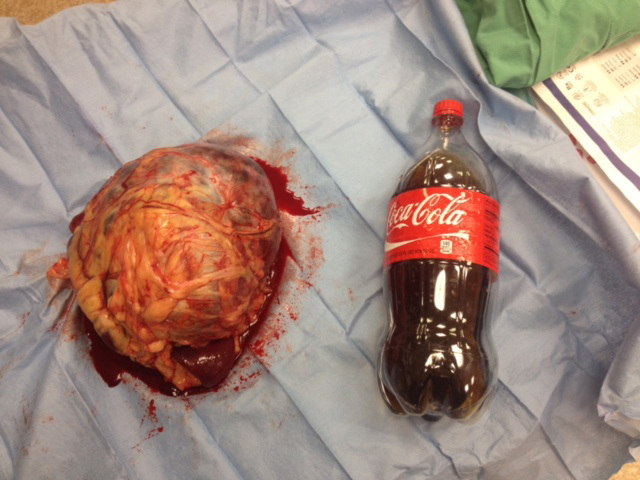 That is a 2 liter bottle of Coke for size comparison!! At that same time Sheila was having surgery. I was informed that everyone at the clinic observed her operation. Dr. Rockar removed what ended up being a nearly 9 pound tumor from Sheila’s abdomen. Sheila is not a huge dog. I guess she’s what you’d call medium-sized. 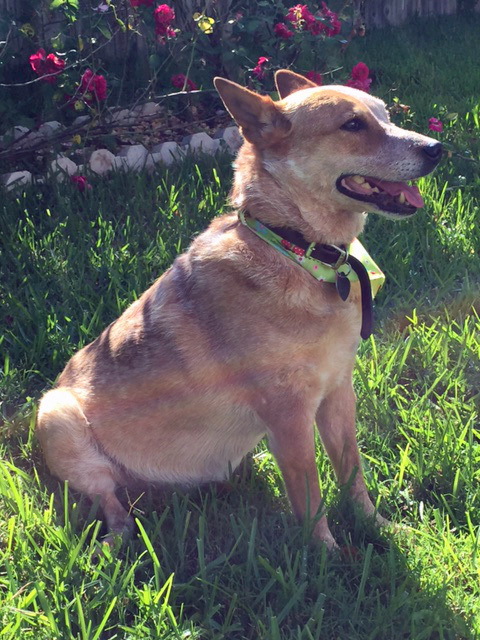 She’s an Australian Red Heeler & they weigh 35 – 40 lbs. Sheila had been weighed at 44 lbs the day before her operation. Nearly 9 pounds of that was the tumor so she’s nice and thin again and weighs 35 lbs, her perfect weight for her breed. I kept posting about this to my Facebook timeline and I also had to start a GoFundMe account for her medical costs, which went up to just over $2,000 and will probably go a bit higher with the necessary post-op care she will require. My family and I are VERY appreciative of the donations that have come in so far. We didn’t have the money for this. Normally, we’d just put it on a credit card and pay it off when we could, but right now we’re avoiding accruing any debt due to Stuart’s job hanging in the balance. Last year was a very meager Christmas. We spent only on our daughter and we didn’t want to have the same for this year, so we were being very careful with our spending. I’m happy to report we are now nearly one-quarter of the way toward meeting our goal for Sheila’s fund. 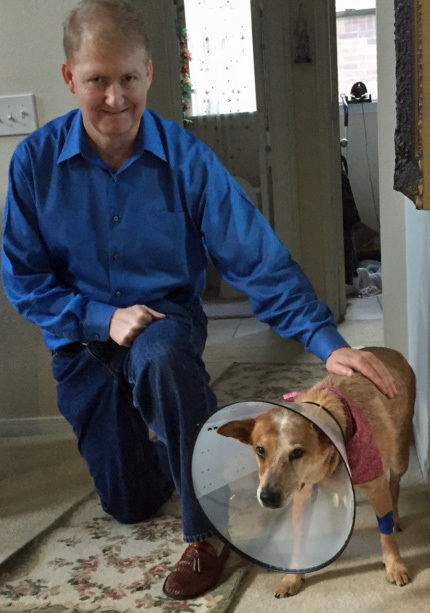 Sheila back home from the vet & a very happy husband to have his beloved dog back home. Sheila experienced what everyone at the clinic is calling a “miracle.” The vet had told us Sheila would need extended post-op care that evening and probably most of Saturday in an ER animal clinic, which would run us “a few hundred dollars more.” When she woke up, however, she was doing so well and being so responsive that he felt confident about sending her home with us! So Sheila began her recuperation at home under our loving & watchful gaze. She had a very restful remainder of the day and night due to all the medications she had as a result of the surgery. By Saturday afternoon Sheila’s bodily functions were back and that is always a major hurdle after a huge operation like that. Sheila’s incision is 13 1/2″ long and she has 18 staples. I don’t even know how many stitches she has. I would guess around 50 – 60. It will be a long recuperation time, but thanks to all the prayers and positive energy focused upon her by my lovely Facebook friends, Sheila is our little miracle. She is hobbling along as best she can on 3 legs since the torn ACL will not allow her to put weight on her right hind leg, but starting yesterday (Monday) she was back to wanting to chase the cat, who LOVES to be chased & will taunt the dog until Sheila runs after her. I’ve had to yell at both of them off and on all day yesterday. Both animals were very confused. They play “chase” every single day. keep her in your prayers because she has a long road ahead of her, including a second operation to repair her torn ACL. I also ask you please keep Stuart in your prayers as well as his job situation, that he meets his quota every fiscal quarter with a minimum amount of stress. Stress levels at home had been very high since we returned from vacation. The day he went back to work Stuart was put on probation by his bank! What a thing to come home to, right? He hasn’t been eating or sleeping right, and there I am keeping positive and having to hold him up, remain positive for our daughter who is a Junior in high school & decided to turn on the gas and take all AP and Pre-AP courses for her 4 core courses this year & is feeling the strain of that already and we’re not even a month into the new school year. Plus she suffers from anxiety. I am holding down the fort as best I can, but even I crater. Just because I’m psychic, read cards, am a professional artist, and have had a deck and book set published does not mean things in my life never go way off kilter. Things are off kilter now so I ask for your help with prayers and positive energy. I so much appreciate it. Meanwhile, if you can share this post so people see the GoFundMe link for Sheila, I would very much appreciate that as well. There are many worthier causes on GoFundMe. The Syrian refugees, is but one. Deputy Darren Goforth is another who was shot FIFTEEN times in the BACK as he filled his cruiser with gas at a north Houston gas station, which isn’t too far from where we live. He leaves behind a wife & children. I ask that you place more value on the funds for the Syrian Refugees and Deputy Goforth than on Sheila, but if you have a couple of dollars to spare once you’ve helped out with those funds, my family would surely appreciate your help. Her GoFundMe is at: http://www.gofundme.com/aa3dkwp8. Never forget: no matter the cause – every little bit helps, & in our case is deeply appreciated. Next Will the Chicago Cubs FINALLY Achieve the Dream?